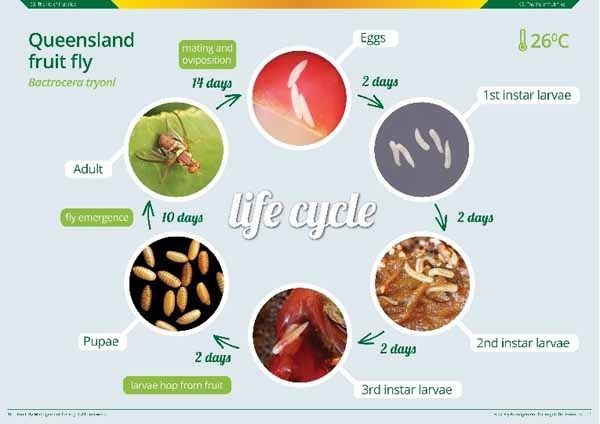 Queensland Fruit Fly (QFF) are tropical Queensland rain forest insects, that need the fruit of a plant to host their young in order to reproduce the next generation. 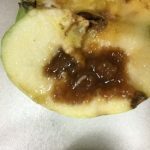 The presence of larvae inside cause the fruit to rot, resulting in inedible and unsalable fruit. Over time, QFF have extended their range from their native habitat in Queensland rain forests and moved into more marginal habitats, establishing populations all along the east coast of the Australian mainland. Experience in the Yarra Valley, Victoria, provides a useful case study for other areas under threat. The Yarra Valley, in line with the Victorian Fruit Fly State-Wide Action Plan 2015-2020, shares responsibility for protecting production horticulture and home gardens in the region by strengthening regional QFF awareness, prevention and preparedness, and harnessing industry and community action for fruit fly incursions. Located on metropolitan Melbourne’s eastern fringe, an hour from the Melbourne CBD, the Yarra Valley region is a significant Victorian producer of strawberries, blackberries & raspberries, blueberries, apples, pears, cherries, stone fruit and wine grapes. Garden ‘fashion’ trends have promoted a rise in the number of home gardens growing fruit and vegetable as well as an increase in the variety of fruiting host plants. Yarra Valley urban gardeners have delighted in the healthy soils, temperate climate and good rainfall of the region. It is a privilege that Yarra Valley growers and gardeners take for granted to be able grow this wonderful fresh, healthy and tasty produce without intense pressure from Queensland Fruit Fly. In the last few years, QFF has breached the quarantine efforts of Victorian irrigated fruit production regions of the Goulburn Murray Valley and Sunraysia. The Bendigo region has also experienced increased urban QFF pressure and occasional outbreaks have occurred in the inner Melbourne area. Despite this pressure, the pest has historically been absent from the Yarra Valley region, allowing fruit and vegetable production to thrive without intervention from expensive and intensive QFF management techniques. 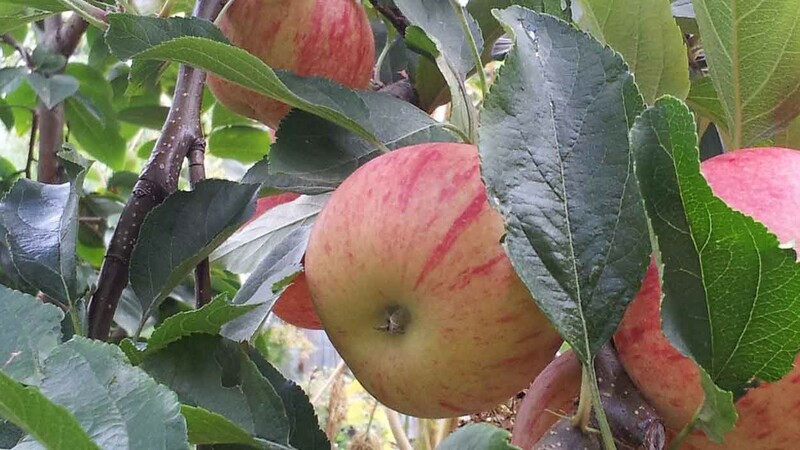 The Yarra Valley supports a Pest Free Places of Production (PFPP) program where participating growers can take extra management precautions and certify produce as “pest free” for interstate trade, and not need to perform QFF post-harvest treatments that can deteriorate fruit quality and shelf life. Certified surveillance traps along with copious numbers of fruit inspections, ensure that the fruit is free of QFF. Commercial growers increasingly recognize the importance of property hygiene and host plant maintenance, tighter on farm biosecurity, the benefits of growing without QFF pressure and increased market opportunities. In April 2017, a Victorian state government grant awarded to the Yarra Valley QFF Taskforce and Agribusiness Yarra Valley, has seen the development of the “Yarra Valley Fruit Fly Action plan 2017-2019” and the employment of a full-time QFF coordinator for the region, Bronwyn Koll. Fruit industry and PFPP representatives, the Box Hill Institute’s Biosecurity Centre of Excellence, local council and Victorian government have worked together developing the plan’s key actions; to increase community engagement and QFF education, increase QFF awareness, strengthen the efforts to prevent QFF, and improve the ability to respond rapidly to a detection and take precautionary actions. This collaborative effort has begun to be reflected on the ground, with community groups, residents and commercial producers volunteering to improve home garden biosecurity, and informing others about how important an issue this is. Community members have said “Ever since I have known about QFF from Bronwyn, I go out into my garden every day and pick up the lemons that have dropped”, “Our community garden members will be on the lookout”, “I now know what to look for and I’ve told my friends and neighbours”. The Yarra Ranges Shire council and Landcare groups are also sharing the important prevention message to residents of the region. The action plan has supported the PFPP program by contributing to the continuation of the successful fruit fly trap monitoring program in the Yarra Valley. The PFPP growers are leading the way in property hygiene and biosecurity, preventative best practice management strategies and product handling requirements that other growers can implement. The action plan focuses on Bronwyn delivering education and best practice awareness programs to the Yarra Valley producers, all residents, community groups, schools, fruit retailers, agritourism enterprises, restaurants and cafes, fruit transporters, gardeners and service providers like agronomists, nurseries and horticulture consultants. 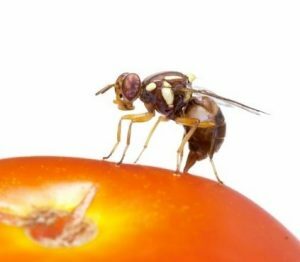 With everyone making a contribution to the prevention of QFF, the region has a good chance of remaining fruit fly free and dealing with any incursion. A challenge for the YV region is increasing the rate of voluntary participation in these precautionary practices. Actions like removing unwanted and unmanaged host plants, better managing host plants that are desired to be kept, picking all the ripe host fruit before it drops (and also picking up the dropped ripe fruit), and covering the crop with protective netting, are all an increase in hard work, and a change to old habits (if not normally done already). The important thing to note is that these actions can prevent the need for even harder work involved in managing fruit production in a QFF area! Growing fruit in regions with QFF is a test to the patience of many, with some choosing to remove all host plants from their once thriving edible gardens because the effort is just too much. Trapping, baiting, netting, cleaning up and trying to eradicate the pest requires a greater effort and fruit production is less rewarding in QFF regions, particularly if a few QFF insects get past the concerted preventative efforts. An easy action to take is better planning production areas before they are planted, so that protective structures can be planned into the project construction. Designing a production area either in a home garden, community garden or commercial scale, must include the ability to easily harvest the fruit. When something is easy, it is more likely to be done well. The other planning advice is to only aim to produce the quantity of fruit or vegetable that is likely to be used since waste that is left lying around is a risk and can attract this undesired and unwelcome pest. Some gardeners are considering crops that ripen at times when QFF is least prevalent. Another great challenge is to encourage people be aware of the risks of transporting fruit into the Yarra Valley. If fruit which is not recognised to be infected is carried into the Yarra Valley and then disposed of without treatment into (or nearby to) a suitable habitat for the insect e.g. a compost or garden, the hidden QFF larvae could mature and create a new generation. This simple, often innocent action, could threaten the production of much of the fresh fruit supply for Melbourne, and Australia, impact on the viability of Yarra Valley horticultural businesses, regional employment, value adding businesses, and deprive home gardeners of the ease of growing home grown produce. Education about good biosecurity practices is essential and cooperation from all people (residents, business owners, tourists and the labour force) is vital for keeping the Yarra Valley Queensland Fruit Fly Free. A quick response to any outbreaks is also essential. An outbreak response or early management response relies on early detection, reporting to the Yarra Valley coordinator (0490381999) or Biosecurity Victoria (136186) and an appropriate coordinated area-wide response. This can include extra QFF traps, bait sprays, and removal and treatment of fruit – the fruit that is infested and also the fruit that is near by that could be infested. It can even include the need to use insecticides, however these must be used with careful consideration and manufacturer’s recommendations. Traps and baits are available from nurseries and horticultural chemical onsellers. Many people are relying on physically damaging the larvae, trapping the adult insect and destroying the pupae to control an outbreak. 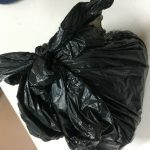 Removing the fruit and vegetables is the primary and key response, and infested fruit treatment can be any of deep freezing, microwaving, boiling or solarizing in a sealed black bag left in the hot sun for about a week (away from birds and other animals). All of these actions cause the larvae to be destroyed. We can learn from the other regions that have QFF. Ignoring the warnings about this pest only results in it taking its liberties and moving in for good. Keeping the Yarra Valley QFF free is essential to the success of the PFPP, the economic viability of Yarra Valley horticultural industry, the shire as a whole and home grown produce. The establishment of QFF is a real risk: there are no physical barriers to fly or fruit movement and many host crops are grown in the region. 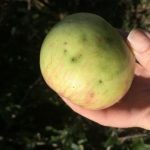 Whilst southern climates are not ideal for QFF, numbers could build up very quickly if crops were left hanging after a poor season, adverse hail or rain events and if appropriate orchard hygiene is not observed. Prevent infested fruit coming into the region. Visually inspect fruit and use traps to monitor for QFF. Apply bait and use traps to control QFF populations. Physically protect garden trees with exclusion nets. Pick all ripe fruit and clean up all dropped fruit. Remove unwanted or unmaintained QFF host plants. Prune QFF host plants – keep to a manageable height for harvest and netting. Only grow a volume of fruit that can be used. Freeze or use heat (boil, microwave or solarise in a sealed bag) to treat infested fruit. Dispose of treated fruit in the rubbish bin, not the compost. For more information, see www.fruitflyfreeyv.com.au, www.agriculture.vic.gov.au/qff and www.preventfruitfly.com.au.